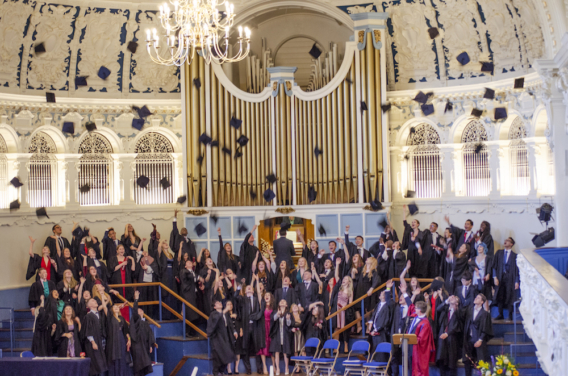 I studied the IB diploma at EF Academy Oxford, graduating in 2018. Since the beginning of this year, I’ve been at the University of Amsterdam’s College, studying physics. My Diploma will be Bachelor of Science and Liberal Arts. In this course, there is a wide range of subject choices available. I chose physics. We started with mechanics, which I studied at the beginning of my IB1, and of course revised for, as it was in my final IB exam! A couple of weeks ago we did complex numbers, and I thought, oh, I did that in IB1. IB was quite advanced and has meant that I’m comfortable with the beginning of the course. As a result, it has been nice to know the content I’m studying at university, and to feel confident. However, university quickly goes deeper than the IB program! Next year I can choose further modules, and divide further into different subjects. I think that’s the best thing about studying this kind of course, having lots of choice, and being able to focus in on the topics that interest you, or are relevant to the direction you want your studies to take. I very much enjoy the University College being a diverse and liberal university with different choices. Rather than, for example, a UK university, a university college is more similar to the American system. Mine is divided into three subdivisions: science, social science, and humanities. Throughout the three years, we specialize in one major. Later this year I’m going to try biology just to see if I want to do that. Some UK courses were much narrower. For example, Oxford has Physics or Physics and Philosophy. I like where I’m studying, as it’s quite international and English is the first language. I didn’t want to go back to a Dutch-speaking school, having improved my English at EF Academy. I think EF Academy prepared me well for university life. There were small classes and small groups with a tutor. At university the set-up is similar. There are also lots of different clubs, a variety of activities, like there were at school, although the size of the university means there is a wider range of activities. My advice for students studying at EF Academy is to make a list of things of subjects that you do understand, and one of the things you don’t understand. Work on shortening the list of things that you don’t understand! Read feedback and act on it. Have short meetings with teachers because it will help a lot. Ask your teachers lots of questions and attend after-school sessions. We had that in all subjects. Finally, I remember spending all hours in the library around my exams and it pays off because that time actually goes quite quickly. And always do the homework! The pressure of work at university compared to school is hard to define, as different people put different hours into their studies, but it is manageable because school gives you the discipline to work hard studying six subjects! There isn’t any other option at school, but it prepares you well for life. Hear from more of our alumni and other student stories from EF Academy past and current students.